Following text is Reproduction of Bhagat Puran Singh Jee’s rejection letter to the Indian Government renouncing the honour of Padam Shree (the fourth highest civilian award in India, awarded by the government) after Indian army’s attack on Darbar Sahib (Amritsar) in 1984 (Operation Blue Star ). Subject: Return of the award of Padam Shree against the in-human army action at Sri Darbar Sahib Sri Amritsar. Sending the armed forces into Sri Darbar Sahib for military action has already produced countless painful results. As a result of this army action the Sikh world has been deeply hurt. You have seen how painful has been the effect of this army action on the Darshani Deodhi and the building of Sri Akal Takhat. Army has perpetrated acts, which you could not have known. Up to September 9, 1984, I have been investigating what I have heard from the people. I have exercised much restraint and have not rushed to conclusions. I will relate some of the happenings (that I have investigated). 1. Army-men arrested a scripture reader of Sri Darbar Sahib along with his family. The entire family was not given either food or water for the whole day. Rifle butts were administered on the scripture reader’s hands the whole day. Another scripture reader of the shrine was given the same treatment until his hands were swollen. 2. The sangat in Darbar Sahib complex consisting of women, men and children has been fired upon (and killed) as the mosquitoes are wiped out with poisonous spray. 3. The pilgrims who had been arrested in Sri Darbar Sahib and Teja Singh Samundari Hall around 12 noon on Tuesday were given water by the Sikh army-men after thirty hours on Wednesday. The children’s eyes were popping out with thirst and their mothers tried to moist their lips with sweat. When some women asked for water for the children the army-men told them that the children would grow up and kill the army-men so why should they be given water? On Tuesday the small quantity of water that was given to the children had cigarettes thrown into it. They were told that this is the prasad of their Guru. Army-men smoked cigarettes in Teja Singh Samundari Hall and kept on blowing the smoke at the Sikhs. The treatment meted out to the Sikhs in the name of army action has deeply hurt the feelings of the Sikh world. Hands of the young pilgrims, arrested from Darbar Sahib, were tied with their turbans, their hair were untied and used to cover their eyes with. They were forced to kneel down on the hot marble floor and to walk around on their knees. Hands of the boys were tied behind them and they were shot through their foreheads. On the first of June 1984 the CRPF had commenced firing on Sri Darbar Sahib Amritsar. 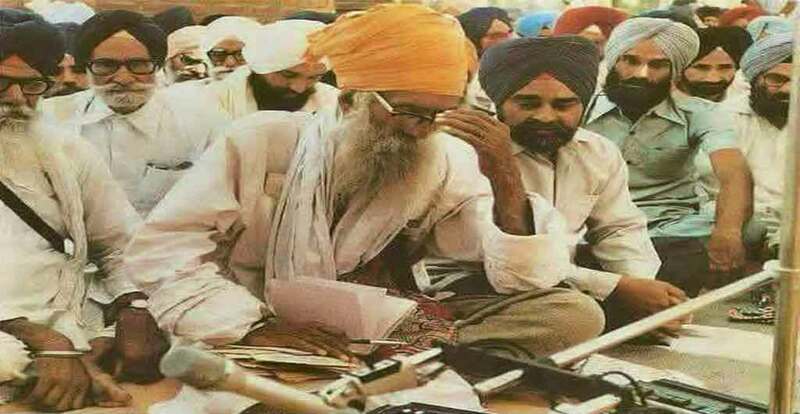 On the first of June before the arrival of the army, the CRPF had killed a scripture reader in attendance upon Guru Granth Sahib and the volume itself was shot at. After it was all over, the Sikh Reference Library and the Sikh Museum were set on fire out of enmity and in pursuance of predetermined action. On June 3, 1984, two Sikhs wearing yellow turbans and kirpans got off at Batala bus stand. They were asked by the army-men to take off their turbans. On their refusal to do so they were both shot dead. Another Nihang was shot at and killed near Gumtala jail because he had refused to surrender his kirpan. One Sikh in proper Sikh dress was standing on the roof of his house in an area of Amritsar called Kittas. Army-men killed him because he was wearing a yellow turban. On the third of July a black turbaned and kirpan-wearing young Sikh of about 25 years of age was walking past the Kitchlew traffic island. The army arrived, handcuffed and arrested him although nothing incriminating was found on his person. When army-men went to arrest the President of the Shiromani Gurdwara Prabandhak Committee Sardar Gurcharan Singh Tohra from Teja Singh Samundari Hall, one of them was smoking a cigarette. When Sardar Tohra asked him not to smoke (in the holy precincts), his reply was, “shut up old-man or I will shoot you dead. Tohra said ‘I am the President of this place’ upon which the army-men became quiet. Temple servants of Sri Darbar Sahib Mukatsar, were made to lie face downwards in the circumambulatory path around the sacred tank and beaten mercilessly. As a result of this one of them died. All those boys who had taken amrit were pulled out of their homes in the villages and were beaten severely. I am compelled to observe that the army has displayed bankruptcy of character and has acted with hearts full of enmity and in a manner indicating that it wanted to wipe out the Sikhs. Young-men from villages have been troubled much after the army action. Apart from the truth depicted above, I have received information about such shameful incidents, to mention which is to violate the cultural norms. After hearing of and seeing such happenings, I reject and return to you the award of Padam Shree conferred upon me.